Recently, civil society has been celebrated as a solution to political apathy and cynicism towards representative democracy. This book, however, argues that the role of associations in and for democracy is only properly understood if we take the context into account. The authors collected in this volume critically examine the crucial link between the associative sector and the health of democracy. Focusing on the role of context and using diverse approaches and empirical material, they explore whether these associations in differing socio-political contexts can sometimes undermine rather than reinvigorate democracy. 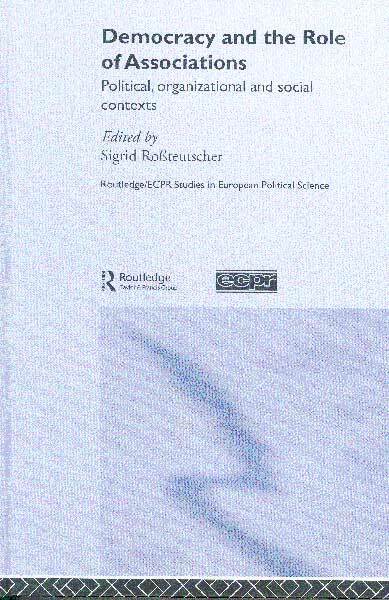 The book features empirical and comparative studies on the effects of associative democracy focusing on Western Europe, Eastern Europe, Northern Ireland, European Union institutions and South America. It will interest students and researchers of social capital, civil society and associative democracy. 6 The position of interest groups in Eastern European democracies: maturing servicemen or trojan horses? 12 The associative elixir: lure or cure? Emma Clarence has worked at Staffordshire University, the University of Central England and the University of Aberdeen as a research assistant before becoming a temporary lecturer. Research interests include public policy in the United Kingdom and citizenship, immigration and multiculturalism in Australia. Feargal Cochrane lectures in the Politics and International Relations Department at Lancaster University, UK. He has researched and written extensively on Northern Ireland, civil society and conflict resolution. His most recent publications are People Power? The Role of the Voluntary and Community Sector in the Northern Ireland Conflict and Global Governance, Conflict and Resistance. Paul Dekker is professor of civil society studies at Tilburg University and research fellow of the Social and Cultural Planning Office of the Netherlands. His work focuses on civil society and political attitudes and behaviour. Meindert Fennema is professor in Political Theory of Ethnic Relations at the University of Amsterdam. With Jean Tillie he is preparing a book on multicultural democracy. He is also an expert on the extreme right. His latest publication (with Wouter van der Brug) in this field is on electoral support of anti-immigrant parties in the European Union and appeared in the European Journal of Political Research in 2003. His books include Communist Parties in Western Europe and De Moderne Democratie. Joep de Hart is a senior researcher at the Social and Cultural Planning Office of the Netherlands. He received his Ph.D. in sociology from Nijmegen University. His publications include books on youth subcultures, religious developments, social norms, social cohesion and civil society. Grant Jordan is Professor of Politics at Aberdeen University. He has published widely in public policy field (especially policy communities) and interest group membership and policy impact areas. His most recent book length study is Shell, Greenpeace and Brent Spar. Umut Korkut is an Assistant Professor of International Relations at Doðuþ University in Istanbul, Turkey. He received his Ph.D. in Political Science from the Central European University and has published in Perspectives on European Politics and Society, Central European Political Science Review, and currently have articles under review for Europe-Asia Studies and European Journal of Industrial Relations. William A. Maloney is a Reader in Politics and International Relations, University of Aberdeen. His main research interests are in the area of interest group politics (issues of organizational maintenance and external relations) and political participation. He is currently co-director (with Grant Jordan) of the research project ( "Beliefs and Actions: Why Predisposition Differs from Mobilization" ( funded under the Economic and Social Research Council Democracy and Participation Programme. Nadia Molenaers is a lecturer at the Free University of Brussels and a post-doctoral researcher at the University of Antwerp. Her main research interests evolve around institutional performance and the role of civil society in developing countries. Sigrid Roßteutscher is a Reader at the University of Mannheim and senior researcher at the Mannheim Centre of European Research (MZES). Her main interest is in participation, values, religion, social inequality and associations' role in contemporary democracy and the re-construction of present-day welfare states. Per Selle is Professor in the Department of Comparative Politics, University of Bergen and Senior Researcher at the Stein Rokkan Centre, Bergen. His research interest include voluntary organization, environmental movements, political culture end democratic theory. His latest publication is Investigating Social Capital with Sanjeev Prakash. Stijn Smismans has a PhD from the European University Institute in Florence and has been Marie Curie Fellow at the Institut d'Etudes Politiques in Paris. He is currently back at the EUI as a Jean Monnet Fellow. His interdisciplinary research (law, political science and political theory) deals with institutional and governance issues of the EU, and his focus is currently on the participation of civil society in 'new modes of governance'. Jean Tillie is program leader at the Institute for Migration and Ethnic Studies at the University of Amsterdam. He is also assistant professor at the Political Science Department at the same University. Dag Wollebaek is a Ph.D. candidate at the Department of Comparative Politics, University of Bergen. His research focuses on social capital, the voluntary sector and the dynamics of organizational change, subjects on which he has published several books and articles. One of his recent papers (with Per Selle) won an award for best contribution in 2002 to the Nonprofit and Voluntary Sector Quaterly. E. Spencer Wellhofer is Professor of Political Science at the University of Denver. His work focuses on the historical analysis of civil society and democratic transition.